Hello Chickens! Wanted to introduce you to a pal of mine. Dana Bate has just released her debut novel, a delicious foodie fiction romp that I was privileged to be able to read an early copy of and blurb. My little recommendation even made it onto the front cover, which caused all sorts of squee-ing around here. Anyhoo, I thought I would let Dana tell you a bit about the book and share a fab recipe with you all. Even better? She is giving away a signed copy to one of you lucky readers...just comment with the title of a foodie book you love and recommend to the rest of us. Much as I love adulation, please no books of mine...I've read them and I need some new titles for my own pile! Comment with your rec by 11:59PM on Friday Feb. 22, and I'll announce the winner on Saturday. I'm still mostly on mental hiatus after finishing my latest, Out to Lunch, which will be in your hot little hands this December, but I will be back the first week of March with some fun giveaways, new product recommendations, and a couple killer recipes. Till then....here's Dana! 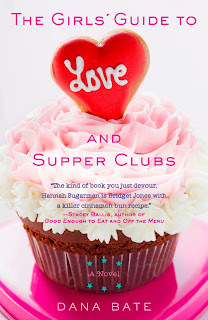 Stacey has been kind enough to let me stop by her blog and say hello to all of her favorite chickens, so that I can tell you a little about my debut novel, THE GIRLS’ GUIDE TO LOVE AND SUPPER CLUBS. Thank you, Stacey! The story is peppered with menus and recipes for dishes like brisket, pretzel bread (highly recommended! ), and smoked Gouda grilled cheese. One recipe not listed in the appendix, however, is a recipe for Hannah’s cinnamon buns – the very cinnamon buns Stacey mentions in her blurb on the cover! Given how much pride Hannah takes in her cinnamon buns, this is an oversight of the gravest sort. 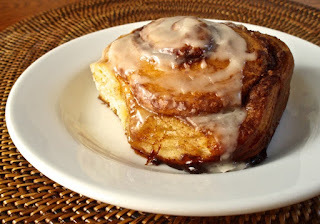 And so, today I hope to make amends by sharing Hannah’s cinnamon bun recipe with all of you. Contrary to what one of the characters in the book says, these buns are pretty freaking great. And don't forget to comment with your favorite foodie read, and one of you will get a signed copy of The Girl's Guide to Love and Supper Clubs! Hannah prides herself on the brioche-like dough she uses for her cinnamon buns, which makes the buns fluffy and delicious. Her trick? Layering cream cheese into the dough, which makes the rolls even softer and richer (a trick she learned in Saveur magazine). The best part about this recipe? You can refrigerate the sliced cinnamon buns overnight and just pop them in the oven in the morning. You can adjust the amount of cinnamon to your taste. For someone who adores cinnamon and can’t get enough, use 3 tablespoons; for someone who thinks a little cinnamon goes a long way, use two. In the bowl of a standing mixer fitted with a dough hook, combine yeast, ½ tsp. of the sugar, and ¼ cup water heated to 115°F (warm to the touch). Stir to combine and let sit until foamy, about 10 minutes. Add remaining sugar, milk, light brown sugar, vanilla, egg, and egg yolk and whisk to combine, making sure the eggs are incorporated. Add the flour and salt. Mix with the dough hook on medium speed until the dough just comes together. Turn mixer speed to high and knead dough for 4 minutes. Add the softened butter one piece at a time until it is all incorporated (this will take several minutes). Continue kneading until dough is smooth and pulls away from the side of the bowl, about 6 minutes. Remove bowl from the mixer, cover with buttered plastic wrap, and set aside in a warm place. Let the dough rise for 1 ½ to 2 hours, until it has doubled in size. While the dough is rising, make the filling. Mix together the sugar, cinnamon, and salt in a small bowl and set aside. When the dough has risen, punch the dough down and turn it out onto a heavily floured surface. Gently knead the dough until it's no longer sticky, adding more flour as necessary, about 1 minute. The dough will be soft and supple. Using a floured rolling pin, roll the dough into a 10" x 10" square. In a small bowl, beat the cream cheese with a rubber spatula until it's smooth and spreadable. Spread the cream cheese evenly over the dough square; then fold square into thirds as you would fold a letter to fit it into an envelope. Take the open ends of the resulting rectangle and fold into thirds again, to make a smaller dough square. Invert the dough so that the seam is face down and, using the rolling pin, gently roll into a 10" x 20" rectangle. Turn the dough so that the short sides are parallel to you. Brush the top of the dough with the tablespoon of melted butter. Sprinkle the cinnamon sugar filling over the dough, leaving a 1" border at the edge farthest away from you. Lightly press the filling into the dough. Using your hands (and a dough scraper if you need it), lift up the bottom edge of the dough and roll it forward into a tight cylinder. Place dough cylinder, seam side down, on a cutting board and, using a sharp knife, trim off the ends; cut cylinder crosswise into 8 equal-size slices. Nestle the slices, cut sides up and evenly spaced from one another, into a buttered 9" x 13" light-colored metal baking pan. Cover pan with plastic wrap and either (a) set aside in a warm place to let rise for 2 hours, or (b) place in the refrigerator overnight. When you’re ready to bake, preheat oven to 375°F. Uncover the buns. If you refrigerated them overnight, let them sit at room temperature for 30 minutes. Bake until golden brown and a toothpick inserted in the center comes out clean, about 30 minutes. While the buns are baking, whisk together the powdered sugar, milk, and vanilla in a small bowl until smooth. When the buns are done, transfer the pan to a cooling rack and let them cool for 5 minutes. Drizzle the glaze all over the cinnamon buns. Serve immediately. Step 1: Unwrap the Kit Kat bars and divide into individual sticks. You will need 60 nice looking pieces to adorn the cake. Chop up the remaining pieces. Set aside. Step 2: Using a cake leveler or sharp knife, remove the rounded tops from all three 6" cakes. Then, divide each cake into two equal layers. Set all 6 layers aside. Each cake will yield a "top piece" which has two cut surfaces, and a "bottom piece" which has one cut surface and one smooth surface (the part that touched the bottom of the pan while baking). Step 3: Spread a thin layer of chocolate frosting on the cake board. Place one layer (a "bottom piece") of cake evenly on top of the board (cut side up). Spread with a thin layer of frosting. Add the next layer (a "top piece"). Spread with a thin layer of frosting. Follow with another "top piece" of cake. Spread with a thin layer of frosting. Sprinkle frosting with some chopped Kit Kat pieces. Tip: I like to assemble the layers on a cake turntable or lazy Susan, to make the process of frosting easier. Step 4: Spread a thin layer of frosting on the smooth side of a "bottom piece" of cake. Place on top of the Kit Kat layer. Continue to alternate cake layers and frosting, ending with a "bottom piece", cut side down, so that the top of the cake is smooth. Step 5: Frost the entire cake. The outer frosting (as well as the layers in-between) should be thin. Because the cake is so high, thick frosting in-between layers can lead to instability and can throw off the ratio of cake-to-frosting, disrupting the balance of flavors. The outer frosting should be thin for the same reason of flavor, but also so the Kit Kat bars have a firm surface on which to stick. Step 6: Transfer cake to a serving plate. It's easier to decorate on the final plate, rather than decorating, then transferring. Begin decorating by setting one Kit Kat stick in place, vertically, with the bottom off the stick flush with the bottom of the plate. Continue by adding remaining sticks (30 in all) as tightly together as possible. The final piece may take a bit of gently wiggling to set in place, but it makes for a nice tight fit and perfect alignment. Repeat process with second layer, lining up the first piece with one of the Kit Kat sticks in the bottom row. Step 7: To finish cake, sprinkle remaining Kit Kat pieces on top. Chill for at least an hour, then serve. This cake is so easy to portion: "Would you like a one-stick piece, 2-stick piece, or 3?" Outside Stacey's amazing books, I have to recommend Beth Harbison's When In Doubt, Add Butter. That's just the first one that comes to mind, since I just read it. LOVE Garlic and Sapphires by Ruth Reichl, it was one of the first books that got me into foodie lit. My favorite (aside from Stacey's) I Loved, I Lost, I made Spaghetti by Giulia Melucci. so funny and so yummy!! Susan Wittig Albert -- Thyme of Death (first book in the series). Fluke's books have a lot of baking, but some other recipes and Albert's books have a lot of recipes with herbs. I've read all books in both series and eagerly wait for the next one! I loved HOW TO EAT A CUPCAKE by Meg Donohue....I could almost taste the yummy stuff while reading! I enjoy Cleo Coyle's coffee shop mysteries-she always adds some delish recipes at the end of the book. Yummy! My fav foodie book is "Meanwhile Back at Cafe du Monde". It's got all these pics and stories from chefs and more about their favorite foods- recipes, etc. Pictures are important to me when I'm wanting to read about food. I also like Lucy Burdette's cozy series- Key West Food Critic series. Haley talks about taste & smells of food- plus there are recipes. Barbara O'Neal does a wonderful job of intertwining a good story with the comfort of food. Thanks for introducing a new writer. I love Katie Lee's cookbooks. Fiction: When in Doubt Add Butter!!! Non-fiction, I would recommend Isabel Allende's Aprhodite: A Memoir of the Senses. Also, anything by Ruth Reichl. Fiction- wow. There are a LOT of good ones out there. Diane Mott Davidson's mystery series is a good one. (Catering to Nobody is the 1st) Michaela Rossener's The Stars Dispose is a fun Renaissance fantasy/mystery with a foodie bent. I could go on at length, but those will do for a start. Anyone who wants a longer list is welcome to email me- it may take a few days for me to answer, but I'll be glad to share more of my favorite food themed books! I loved reading THE BAKER'S DAUGHTER by Sarah McCoy and WHEN IN DOUBT, ADD BUTTER by Beth Harbison. Since I love to cook and bake, these were fun reads for me. I'm not much of a food lit person, Kitchen Confidential and Soul of a Chef are the only ones I can think of that I've read. Well, I did read Maya Angelou's cookbook cover to cover when I first got it. I loved all her stories about the foods. Aunt dimity's death. Every book in her series comes with a fail proof recipe. Nancy atherton's book are quick little books of far off whimsy. The first book in the series is my favorite - every year I take it to the beach and visit it like an old friend. I loved Like Water Like Chocolate (sp?). Or any books that include recipes and pictures! These cinnamon rolls sound fantastic! I love all of these suggestions! Some I've read, but the others I'll have to add to my TBR pile. Keep the suggestions coming! The Cookbook Collector, by Allegra Goodman is as close to a foodie book as I can remember. Too many! Julia Childs' My Life in France, anything Ruth Reichl, Anthony Bourdain's Kitchen Confidential. Anything from the Tea Shop Mysteries series by Laura Childs. They are fast, satisfying reads that combine some of my favorite things: mysteries, amateur sleuths, Charleston, tea, and tasty treats. This book sounds amazing. I'm like Hannah...I'm 26 and having a quarter life crisis. Besides Stacey's books, I really enjoyed Frank Bruni's memoir "Born Round". I devoured that book in 24 hours. I also really liked Gail Simmons memoir "Talking with my Mouth Full" and anything by Anthony Bourdain. I have so many foodie books pinned on my 'must read' list on Pinterest. I love, love, LOVED 'The Provence Cure for the Brokenhearted' (Bridget Asher). Great story with fab recipes! I love mysteries so thanks for all the suggestions. I love the memoir Under the Tuscan Sun by Frances Mayes. It has delicious food and a house to love! Wait....WHAT???!!! There are actual foodie books? As a person whose passions are reading and cooking/baking how did I miss this? Seriously. I think I am going to have to stock my library with all of the titles mentioned here. Sounds better than just reading cookbooks, which I have been known to do. Thanks for opening my eyes! Oh, so many... Anything by Bourdain, Ruhlman, Reichl. Just about anything written by or about Julia Child. Memoirs by David Leibovitz, Gabrielle Hamilton, Molly Wizenberg, Frank Bruni, Kathleen Flinn... I know I'm leaving something out. I love both food and a good mystery so I'm going to say the White House Chef series by Julie Hyzy. An added benefit? She's from Tinley Park (or Orland Park?) so there are some Chicago references in there too.